GOD BLESS AMERICA THE LAND OF THE FREE! 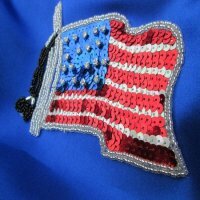 Description: Red, White & Blue patriotic tabret; adorned with a rhinestone, sequin/beaded American Flag applique on white satin. Trimmed in various decorative trims, padded handle and a red matching tassel hanging in front. 6 inch glory hoop with 18 inch streamers. 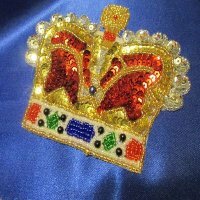 Red heart sequin/beaded applique on back.